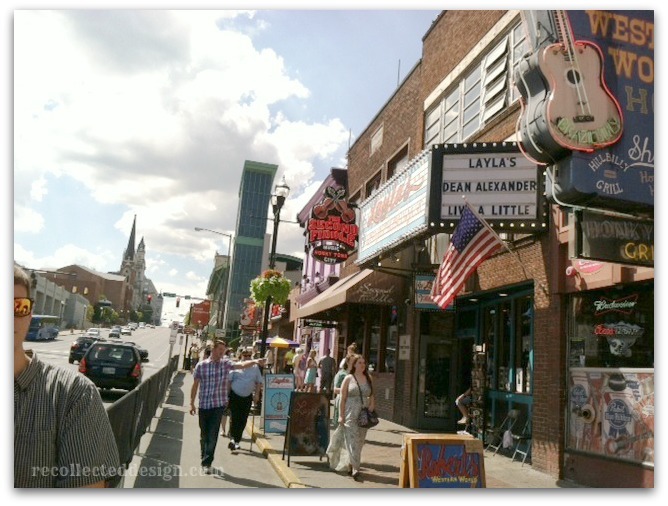 I fully expected to return from our Nashville vacation rested and brimming with answers to situations that had been plaguing me… I thought we’d bring back scads of pictures and treasures from the flea market….I imagined my return would be ripe with ideas for blog posts and new family adventures. I just knew direction and peace would be mine for the taking. Instead I found myself returning much like my gas tank- almost empty. For a week I floundered to find my groove again. To overcome the exhaustion. To re-acclimate myself to this post trip everyday life. To, heaven help me, just remember things again. This act of ‘vacating’ had done me in- and possibly the husband too- who steered us through the 20 hour round trip car ride and the boy who, like the rest of us, had nowhere to hide in our shoe-box hotel room accommodations. Three grown people occupying the same ‘cozy’ space for four days? I’ll let you do the math… What a luxury to return home to our thousand square foot ‘mansion’ complete with individual rooms we could retreat to. What also didn’t help our homecoming was that we seemed to suddenly be plopped into the Pacific Northwest… y’all it felt like Noah was gonna show up any minute with an ark. But today there is this strange and glorious glowing orb in the sky. I feel a ray of hope creeping back in and this time it’s not neon. But amid unmet expectations I did find blessings. I may have searched a state away but they were hidden in plain sight the whole time. Sometimes that’s how God works best. Even in the fogginess of the middle, light and life are ours for the taking because he dwells IN us. 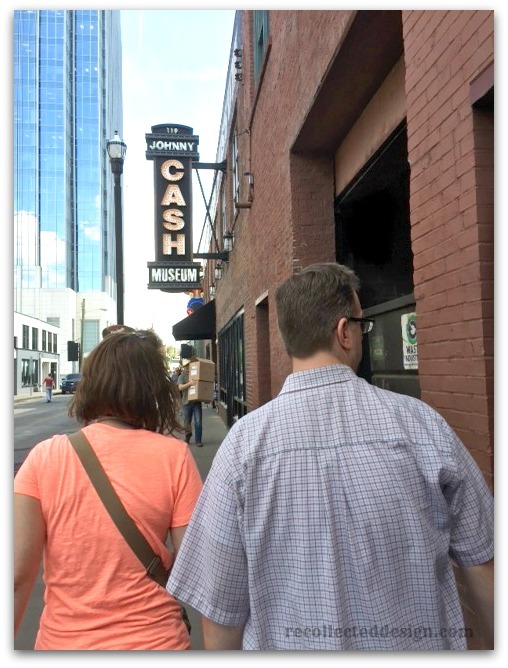 And so I offer you my tips on traveling well…and a shameless cascade of some of the photos from our Nashville trip… in case you want to go someday…or in case you just want to live vicariously through us…either way you’re welcome. This idea of enjoyment drives my goals for any road trip: Stop wherever we feel led, dial through the radio stations for the perfect song and explore the beauty of God’s creation with a fair amount of junking thrown in. The trip out to TN afforded scads of time for doing just those things however I found my happiness waning around hour 9 and we still had an hour to go. At night. With lots of tractor trailers. 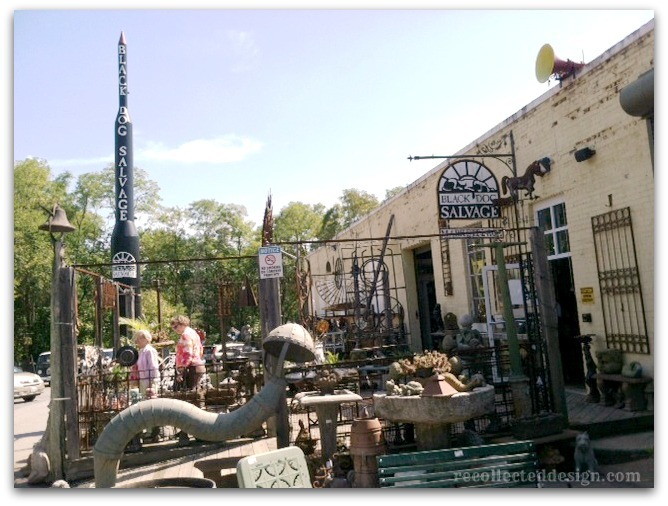 How I longed for that morning when we stopped at Black Dog Salvage in Roanoke before we even made it out of VA.
And it didn’t help much when the boy pointed out earlier in the afternoon that the arrival time on the GPS was in Central Time where we were headed and not Eastern Time like we were coming from so we got to magically do the hour of 5 o’clock over again. We may have asked him to keep any other stellar revelations to himself. This morning I read that God is more concerned with our journey through a problem than the ultimate resolution. Character over comfort y’all. Trials are just tools used to shape us. Knowing our destination makes the journey more enjoyable. We have one life. Or as my 1998 self proclaimed at graduation during the valedictory address: “Life is like this quarter, you can spend it any way you want but you can only spend it once.” Deep stuff I know, but we may as well spend life enjoying it. Yes this is hard when it’s prickly. Or rainy. Believe me I’m right here in the mud with you. I’m learning that happiness will certainly fluctuate but joy should be an absolute… Leave it to a youth Sunday School lesson to turn my outlook around. But for some reason my body decided sleep was just not necessary in Nashville. I was not impressed… and my people probably weren’t either. Forming coherent sentences and giving directions well are pretty important parts of navigating around a new city. Lack of sleep doesn’t lend itself well to finding your bearings on any level. Somehow by the grace of God, we made it and we all still love each other. I think. Just like a vacation, if life is comprised of too much GO and not enough SLOW it will not end well… God didn’t give us the Sabbath for nothing. This is so hard for me and maybe you too? Though I didn’t purposefully loose sleep while we were away I didn’t cut myself much slack during the days to rest either. There was just to much to see and do! And therein lies our greatest struggle– or at least mine. I want to do it all. But I can’t. It sounds counter-intuitive but resting in God is the only way to accomplish anything. 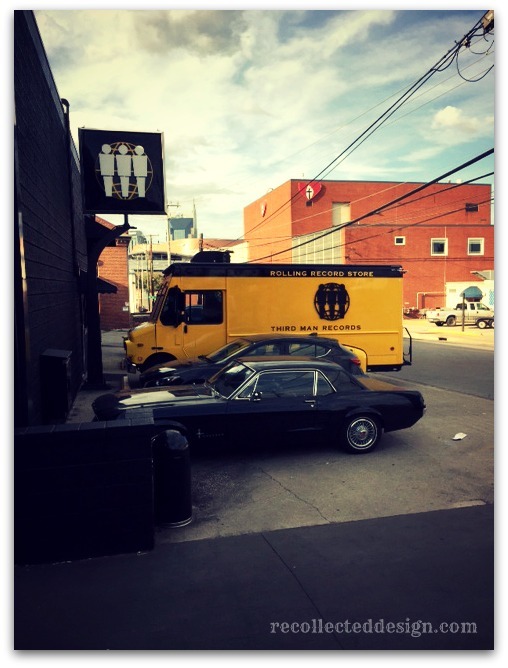 Nashville felt equal parts beautiful and gritty. Much like life. I saw things I expected and some that were a total surprise. 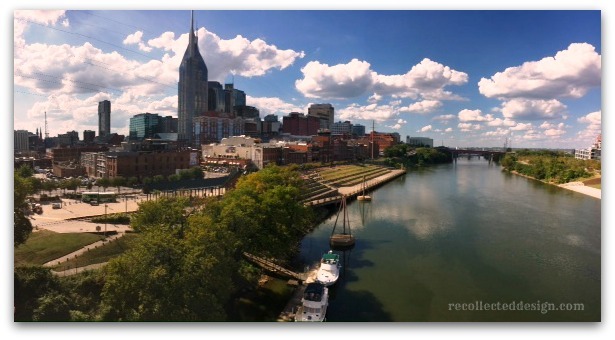 The Cumberland River and the city skyline- beautiful. 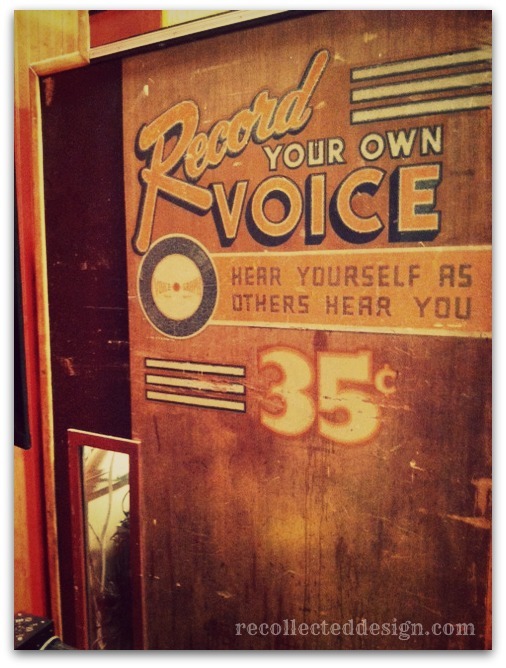 Downtown honky-tonks- loud. Third Man Records-gritty. Antique Archaeology- small! Tootsie’s- large. 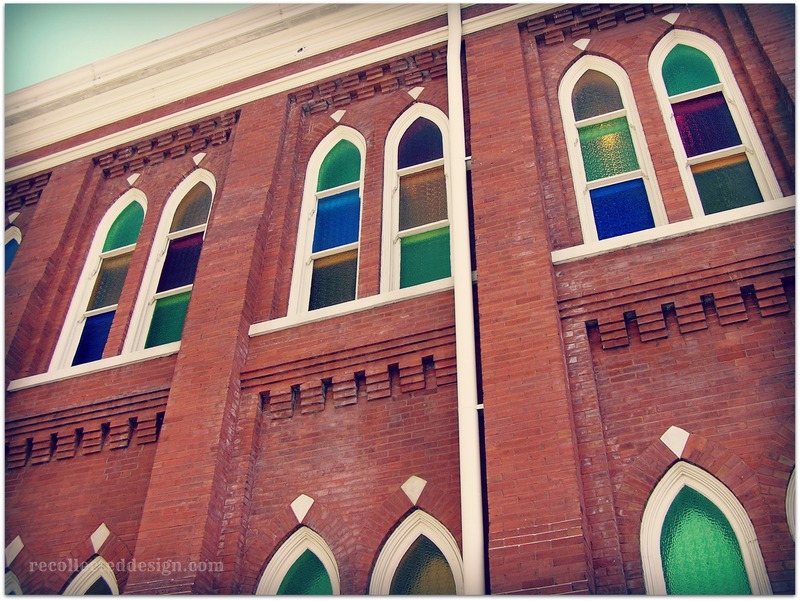 And The Ryman – calm. 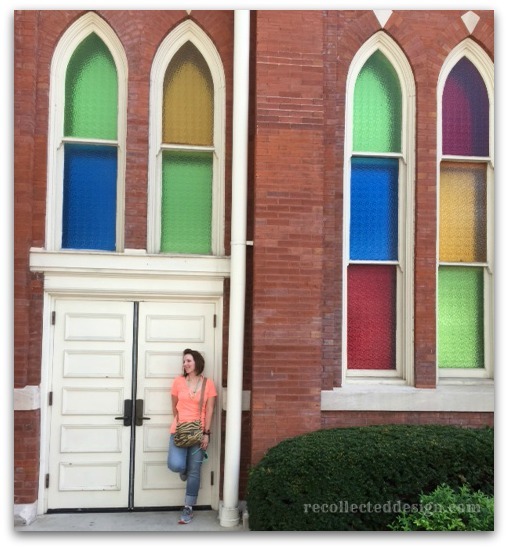 Had we never ventured down the side street behind the mother church of country music, we surely would have missed the surprise of that stained glass. As I look around my house I realize almost every piece of furniture, knick-knack or piece of art came from a grandparent or my dad’s garage or my mom’s kitchen or a vintage store…We like old things. Old movies. Old values. The memories they conjure up. The comfort they bring. Much the same is the role of the bible- a priceless road map and precious reminder of who God is and who he inspires us to be. We would do well to remember those truths no matter where we are. In traffic. At home. Out to lunch. Or stationed at work. Drawing strength from being rooted in the right things. Because wise words and reactions flow from a well tended heart. 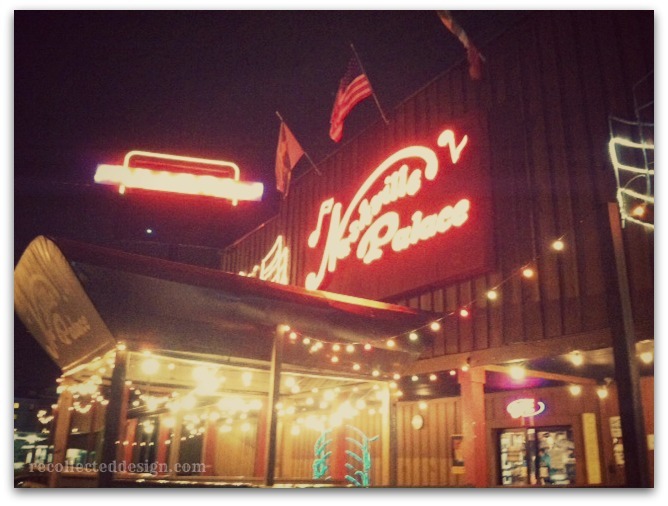 One night we ventured out to the area around the Opry and ended up at The Nashville Palace- a time warp – complete with precious little couples boot-scootin’ and all the old standards front and center. Unlike a younger band we saw a day before, these players had no iphones hooked to their mic stand. The words and the chords for the songs they offered were ingrained in their memory. Never forgotten. 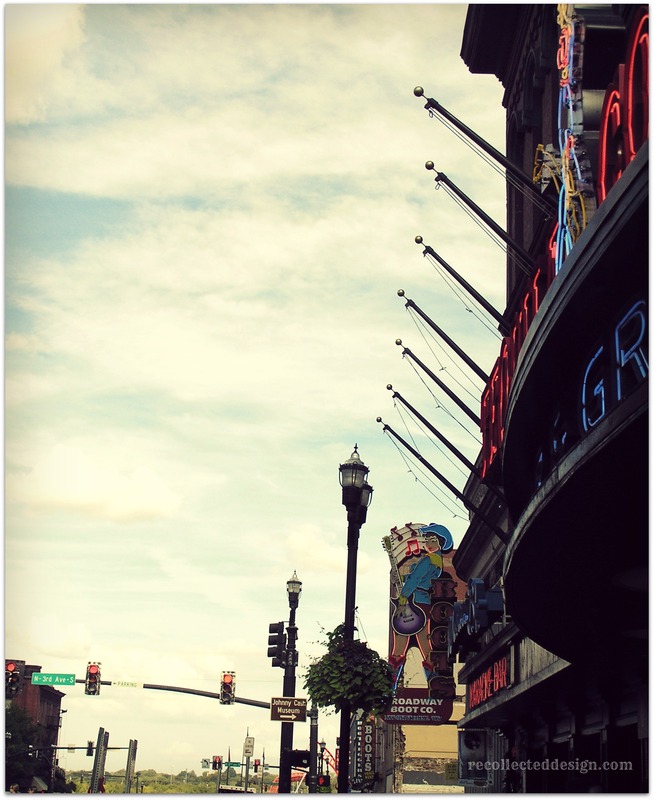 As we visited and explored we realized there was a healthy respect for the sounds and soul of the music that shaped this city. 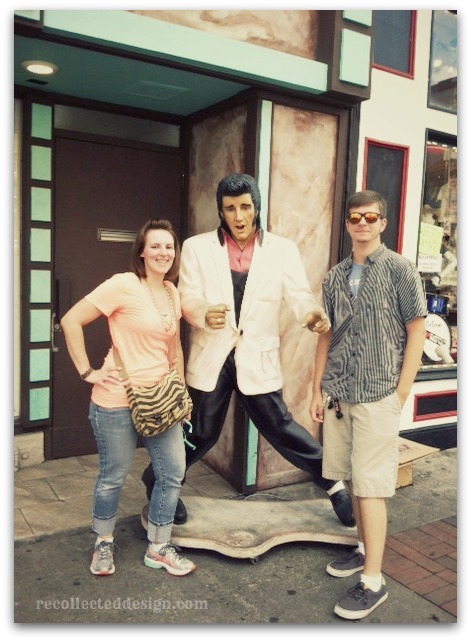 History and Elvis was everywhere. Museums and memorabilia. Things from the past that helped them remember. And though I’m still sorting through the experiences of this trip- putting some on display and tucking some away for safe keeping, I realized God was there. In the discord and the harmony. He is always with us and we pay homage to the past when we commit to trust Him with our future. I may have pouted a bit. Ok a lot. But then I reasoned that God must have had other plans for us in what we did and saw and who we met. And His plans are better than mine all the time. I can try and plot out all these things in my life- points of interest! Things to achieve! Stuff to acquire!- but I can guarantee nothing born out of my own planning will satisfy me. I have to let the Lord have the reigns. One of the central characters of the “Dobie Gillis” TV show in the 1960’s was Maynard, a “beatnik” with beads, sandals, and goatee who avoided work at all cost. He was more comical than intelligent. In one show, Maynard informed Dobie that he was planning to do what many rock stars were doing in that era — make a pilgrimage to the Far East to consult with a guru about the meaning of life. Maynard did his best to explain to Dobie why he felt he needed to speak with an ancient wise man and find out who he really was. So where have you been lately? Did you find all you dreamed of? Did you travel well? We took a trip cross-country – Maine to Seattle, down the west coast and then home through Texas, etc. – about five years ago when our kids were 16, 14, 11 and 8. Fantastic memories that get better every year, but I do remember through the fog that there were moments . . .
Wow that is an epic trip!! Thanks for stopping by! And I agree fully with your comment on how memories get better with time. Slowly the fog is lifting and I’m able to see the good! Sounds like a nice trip. You are so right about the one who created us, did so with a plan in mind. Sometimes that isn’t the plan that we think. Going on a trip is always good, but coming home is always great. Love you girl. Amen!! There’s just no place like home…!